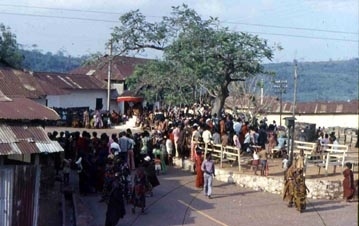 The public square in Obo, in front of the chief's palace, is called "Ohantrase" because it is "under" (ase) the sacred Ohantra tree. 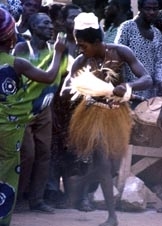 Each of the gods in Obo may celebrate festivals in their own compounds, and many of them travel to celebrate important festivals such as at Buruku, the Chief of the Kwawu gods in Kwawu Tafo, or further afield as in Larteh, Akwapem, the home of the internationally recognised and worshipped (notably by African Americans) God, Akonnedi. 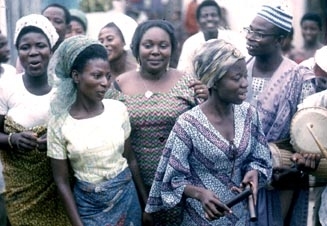 When the Obo chief and his court elders call for an afahye (festival) in Ohantrase, then all the gods and their akomfo are expected to come, as well as sub chiefs and elders in the Obo confederation. 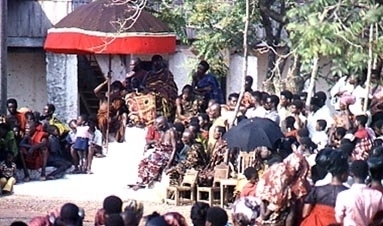 When the Amokade matrilineage came to Obo from what is now Brong Ahafo, near the headwaters of the Tano River, they brought with them the Tano god. It is now considered the stool god of Obo, in that it is associated with the ancestral stools of the Amokade lineage which owns the office of the Obo Chief. 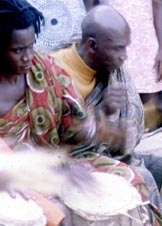 The Amokade matriclan is seen as part of the Aduana clan, as is the Ada matriclan in Obo. 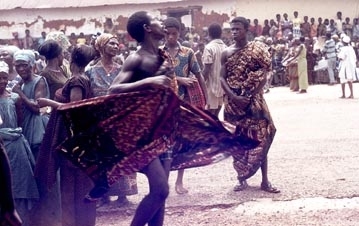 When a priest or priestess enters the circle during an afahye, s/he will walk in a counter clockwise (as viewed from above) direction, greeting all the persons present in turn. Later, should the god possess the כkomfo, then the same person, but with the god in control, will circle again in a counter clockwise direction, greeting all assembled. This god has a large following. His accoutrements include a set of talking drums and several young men who are designated drummers. Holding two fingers up in each hand above his head, the linguist of this possessed priestess makes this signal of encouragement and praise for the dancing. 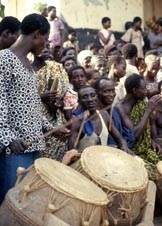 Each god comes with an entourage, including a set of drums with drummers. the drums do not play the rhythm for dancing, but rather talk the drum poetry. 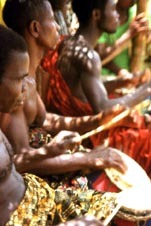 Akan is a tonal language, and the drum poetry is the tone pattern of the sentences as they would be spoken. 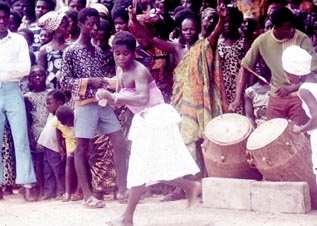 The rhythm is kept by the dawuru (gong gong) which is made of beaten iron, struck with a wooden stick, and sounds much like a European cow bell. 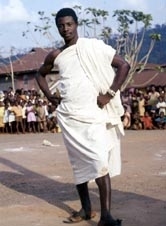 In this picture of an כkomfo, you will see him wearing large black sandals, as do chiefs and elders. When his god comes into him, however, he will discard the sandals, and remove his cloth. He will don the clothing or costume of the god (needing the help of his assistants in order to do so). An acolyte will toss white powder on the ground (some of which you see on the ground behind him in Ohantrase). That white powder serves the purpose of separating white sacred (the gods) from red sacred (the earth). Possessed by an old Guan god. The god who possesses him is one of the older personalities in the river's constellation. In general, when you see a palm string skirt, the god will speak Guan rather than Twi. A person needs helpers to assist her or him in being an כkomfo, as at this time when they must identify which of the personalities has possessed her or him, then help her or him to put on the costume of that personality. This is why the permission, as well as the pro-active assistance, of the relatives and neighbours is needed when an obosom (god) tries to possess a newly chosen person. Without that permission and assistance, the god may become frustrated and the person suffer from mental problems or epilepsy. This young man is in his three years of training under the tutelage of a more senior akomfo. 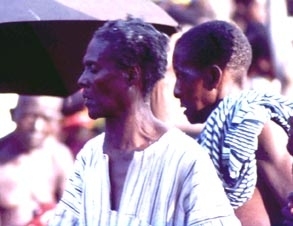 The young man wears his mpsempese hair to show respect for the god. 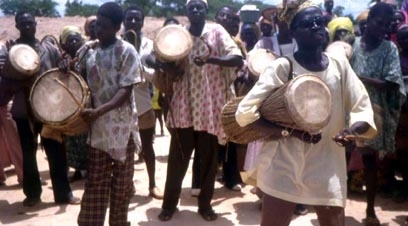 Here he is learning the skills needed to play the talking drum. 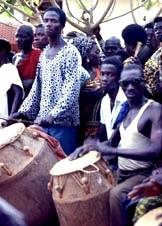 The כkomfo does not play the drum, as such, but needs to learn how it should be played, and therefore needs to be able to play. All the sets of drums are beating at the same time, and the total effect is a cacophony of sound and tension. 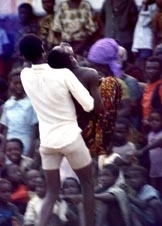 The two women in blue on the left of the picture are noticing that this young man started dancing, got caught up in the tension, and some god tried to possess the young man. When something like this happens, the person must be taken by his family to an older experienced כkomfo to see the reason. If it is determined that an obosom (god) is trying to possess him, which one, and if (and only if) his lineage agrees, then he must go into training for three years to learn how to become an כkomfo, to serve the god which has chosen him.